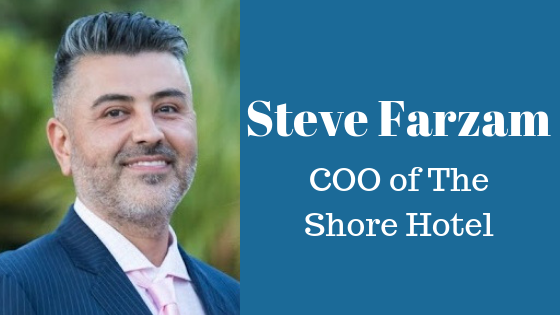 Steve Farzam is the Chief Operating Officer of the Shore Hotel, located in Santa Monica, California. Steve has been involved in hospitality from a young age. After his family acquired their first motel, Steve was set on a path that to his involvement in public service, emergency medicine, and hospitality. His combined skill set and dedication to excellence in all that he does have contributed to Steve becoming a leader in the hospitality industry. Steve has strived to incorporate economically-friendly systems within the Shore Hotel and raising the bar for reducing the carbon footprint each guest leaves behind. He has maintained the balance of his role and responsibilities, all the while implementing groundbreaking initiatives to bring the Shore Hotel to new heights. Steve Farzam’s combined determination and collaboration contributed to the Shore Hotel becoming the first property in the state of California to successfully integrate and deploy the “Auto Demand Response” program, a fully automate system that Southern California Edison to remotely send a signal during critical peak need to shed the hotels’ power consumption by nearly 60 percent. He also teamed up with GreenCharge networks to implement the very first Level II fast car charger in the country. While Steve has been actively contributing to creating a greener planet, he is also passionate about helping fellow humankind. Steve Farzam is a certified flight paramedic and was part of a Disaster Response Team in 2005 that consisted of 11 highly-trained professionals to respond and provide aid to individuals victimized by Hurricane Katrina in New Orleans. He was able to assist FEMA and other agencies in finding and rescuing humans and animals and tended to injuries that would have otherwise been left untreated for hours. Steve’s diverse skill set and his academic achievements, including most recently earning his Juris Doctorate at William Taft Law School, have been some of his greatest achievements, but he considers his crowning accomplishment to be receiving a medal of honor in 2009. In 2008, Steve Farzam saved the life of an unconscious person that had been trapped in a burning vehicle while he was off-duty. He was presented with the Medal of Valor for his bravery and heroic work from the Burn Institute and the San Diego County Board of Supervisors. Steve will continue to utilize his well-rounded skill set, actively implementing green practices and developing new initiatives to make his community, and the earth, a better place to live.